We last caught up with Flayvr way back in May last year, just as the startup finally shook off its iOS-only roots with an Android incarnation. The idea behind Flayvr has always been simple – it monitors your camera roll for photos and videos, and groups them into albums based on the time and location they were taken. These can then be shared via the usual social channels, and are viewable by anyone via Flayvr’s website. Now, two years on and two million users down the line, Flayvr is being rebranded as MyRoll, and is pivoting ever so slightly to become an “intelligent mobile photo gallery,” tapping computer vision and behavioral analysis to tailor your camera roll to you. 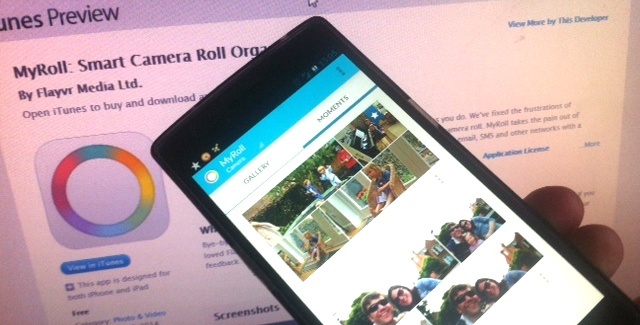 MyRoll is striving to one-up the photo galleries you’ll find bundled on iOS and Android. It automatically organizes your photos and videos into “shareable moments,” surfacing what it deems to be your best captures. While signing in with Facebook, Google+ or email lets you share albums more easily, you can skip signing in to get a flavor (or ‘Flayvr’) of what it’s all about. When you launch the app at first, it’ll take a moment to process the photos, then you’ll be presented with a view consisting of two sections – ‘Gallery’ and ‘Moments’. Gallery is basically just your camera roll, and it offers a nice and simple way of perusing your content and generally keeping things in check. It’s within ‘Moments’, however, where the magic happens. MyRoll prioritizes shots that are in-focus, contain smiling faces, bright colors, and so on. Basically, it strives to separate the quality from the, well, not-so-quality snaps to make them easier to find. And as with its previous incarnation, it separates them out into albums by the time and place they were taken, so you’re pretty much guaranteed to have auto-collated albums of related images. Within settings, you can also select which folders you wish to reveal within the app, be it screenshots, camera, WhatsApp, or more. Each album can be edited with a related title, favorited, hidden from view or shared as entire albums to Facebook, which is a particularly neat and useful feature. Similarly, MyRoll automatically selects the top 10 photos of each ‘Moment’ for sharing via WhatsApp. A nice little touch, too, is that in photo-previews it automatically centers the image around the face in the picture (if there is one), rather than focusing on the true center of the photo. It’s a nicely designed app for sure and one that should prove popular, as it takes the existing qualities of Flayvr and turbo-charges it with a slew of extra features. And yes, it now wants to replace your device’s main gallery app. If you haven’t used Flayvr before now, it’s certainly worth giving MyRoll a little time to show what it can do. Meanwhile, check out the official promo video below.